Steve really, really likes bridges. I've never met anyone else who knows or cares as much about bridges as he does. He likes looking at bridges, walking on bridges, learning about bridges, and watching bridges be built. We've walked across the Golden Gate Bridge together a couple of times, but we'd never walked across the Carquinez bridge, so that was perfect to add to the list of 40-4-Steve. The new span of the Bay Bridge has a pedestrian path, so I'm sure that's in our future! I love to learn what people are passionate about, especially if it's a bit unusual! That BG paper does a great job mimicking the look of a bridge and I love the little pops of red! Interesting. Lots of bridges all over the world to visit! 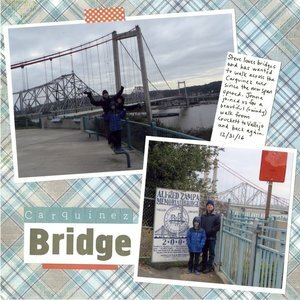 Steve's Dad is a Structural Engineer and did the utilities relocation on the Carquinez Bridge. Yes, I should have mentioned that. Steve's love of bridges has an obvious origin! Loveeeeeeeee this!!!! LOVING the photos!! Has he been back east? NY/NJ ... there are a TON there!!! Yes, he has. No shortage of bridges everywhere we go!